Pre-/Post-command is a useful feature for those who need to run some application or execute commands (or batch file) before/after backup. You may start/stop certain Windows processes or other applications before/after backup procedure. 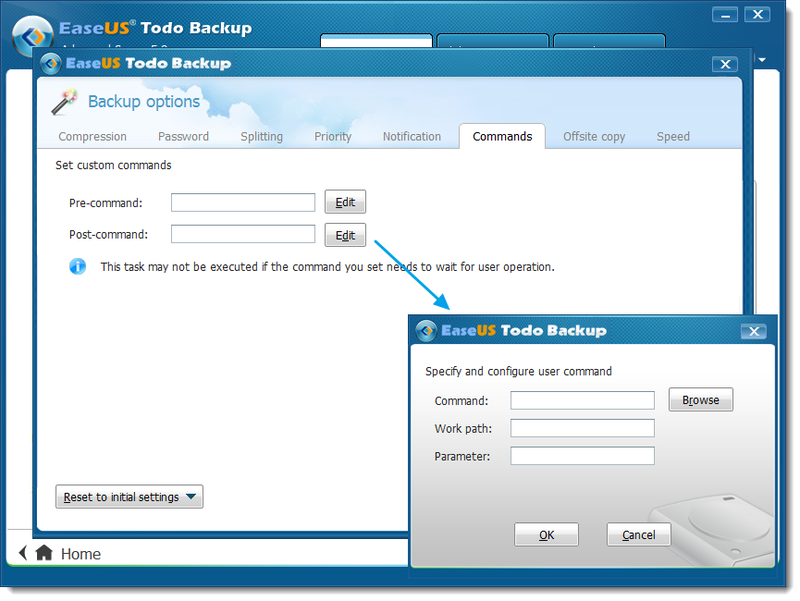 EaseUSTodo Backup allows to shutdown the PC automatically in one-time operation, such as Clone and Recovery. This feature is not available in Schedule backup, you can do it with Post-command. 1. Click Backup options, switch to Commands page. Then click Edit after Post-command to configure it. 2. Use 'shutdown' command to do the job, input it in Command. 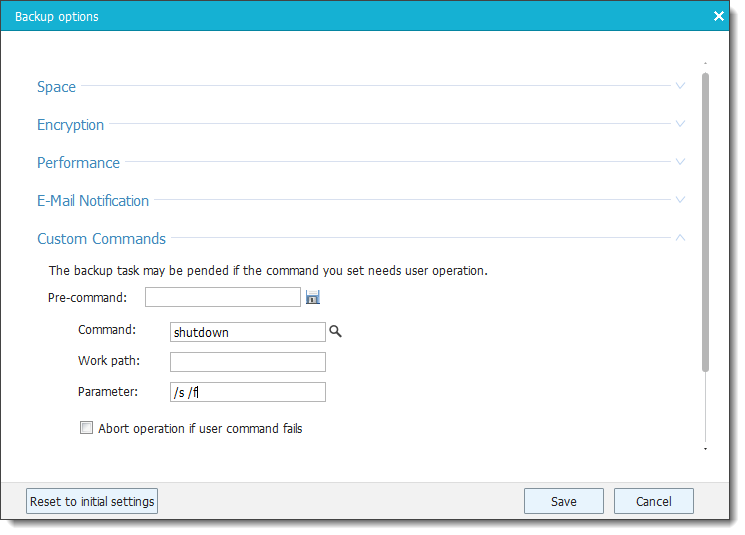 No need to fill in the Work path for it is a Windows built-in command. 3. The command needs some parameters, '/s' to Shutdown the computer. Sometimes '/f' is needed to force running applications to close without forewarning users. 4. 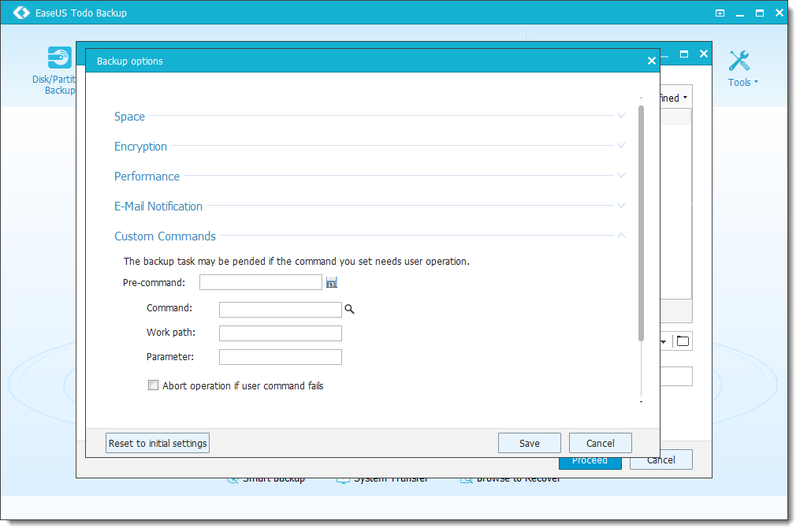 Save the configuration, EaseUSTodo Backup will execute the command after backup and your PC will be shutdown automatically. 1. 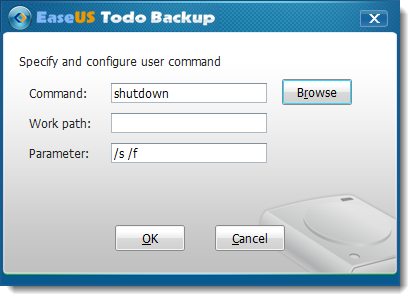 Don't set to execute interactive command, for EaseUSTodo Backup will let it run in background. Unless you kill the command process in Windows Task Manager, the application will never start to back up. 2. If you want to execute a batch file or run an application in Command, make sure you have specified the work path of it.